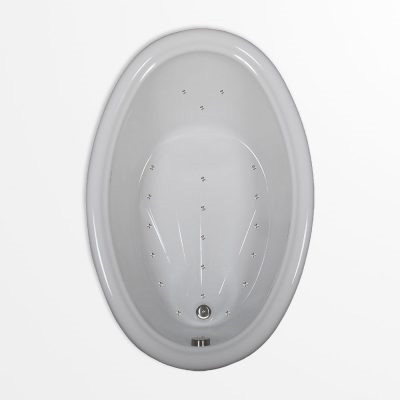 Let the refined style of this oval air bath set the tone for the rest of your bathroom. Its smooth interior gives it an impeccable look that will complement almost any design plan. The rounded raised deck softens the look of this bathtub. A channel detail around its perimeter adds distinction without taking away from its classic design. The bottom of the tub features an arrayed texture, which directs water down the drain and provides some slip resistance. Soothe your tired muscles as 24 air injectors create effervescent water and take satisfaction in knowing that you’re adding to your well-being by investing in this choice air tub.